A growing popularity of the pickup trucks is the opportunity for every carmaker. Everyone now knows that a mid-size ute from Mercedes is underway and Renault Alaskan is also a new member of the family. In the same segment also belongs names like the Ford Ranger, Mitsubishi L200, Nissan Navara, Isuzu D-Max, Toyota Hilux, recently refreshed VW Amarok, etc. However, another candidate which shown interest for the mid-size truck class is the France-based company, PSA Peugeot Citroen group. After this the second largest carmaker on the Old Continent, recovered from the years of financial problems, information came from company’s CEO that they see an opportunity for further growth in the pickup truck segment. This was said in early 2016 and the pickup truck should be in company’s six-year plan. However, nothing has been said since then about the Peugeot Citroen Pickup Truck. What is the perspective of Peugeot Citroen Pickup Truck? The Peugeot Citroen Pickup Truck still remains the possibility as the company hasn’t revealed more details about this project. We expected new details and possibly a teaser image or more to emerge but nothing has been announced from the company so far. Other sources are also on the thin ground with details. What has now been believed, is that this truck wouldn’t arrive before the 2019 model year. More details should emerge in the second half of this year. The Peugeot Citroen Pickup Truck wouldn’t be Peugeot’s first ute as this brand already had a one. For the European-market, Peugeot offered the 504 pickup truck which was discontinued in 1993. Now, the brand isn’t expected to build the new version from the ground up and it would likely do the job as the joint venture with another brand. That would, of course, cut down the costs and the time of developing. The same is doing Mercedes which new truck will share its platform with the newest Navara NP300. In the same way, PSA Peugeot Citroen could co-develop its first mid-size truck with the Toyota. That comes from the fact, that these brands already have a similar agreement with the mid-size vans. Toyota sells the Proace van which is actually the re-badged version of Peugeot Expert and Citroen Jumpy. Similarly, the new PSA group truck could be the new version with the Peugeot or Citroen badge which would be based on Toyota’s super-popular Hilux. 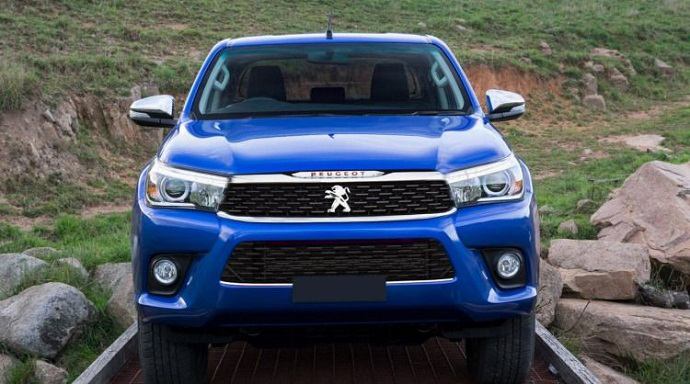 Based on the proven Toyota Hilux, the Peugeot Citroen Pickup Truck would be a great addition to the growing segment. However, as the things now stand, in the best-case scenario this truck could arrive as the 2019 model. What is also expected, this model won’t go to the market over the Atlantic.